You can configure Firefox to download files to one specific folder on your hard drive. If you want to save a file in another location you have to browse your computer and pick the location manually which can be quite a task for someone who likes to sort downloaded files properly into folders on the system. If you download mp3 files regularly for instance, you may want to sort the audio files by genre or artist automatically. This cannot be done automatically in Firefox without the use of add-ons. Update: FavLoc is no longer compatible with recent versions of the Firefox web browser. We suggest you download and install Save File to instead which offers similar functionality and is fully compatible with all recent versions of the browser. 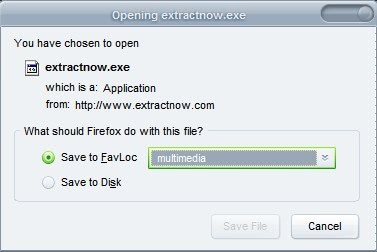 FavLoc is a Firefox add-on that adds so called Favorite Locations to the download options in Firefox. Favorite Locations are folders on a hard drive that have been added to the add-on previously. This makes it a breeze to download files to different folders without having to browse your hard drive anytime you change the folders. By default FavLoc is available in the Image and Link Context Menu, the File Menu and the Download Prompt and there is even support for Thunderbird which extends the functionality to email attachments there. The image above displays a right-click context menu of an image. Four different download folders have been added to Fav Loc where the image can be saved to faster than before. You still have the option to use the Save As dialog to save it to another location on the hard drive if you prefer it that way. The Download Prompt looks pretty much the same except for the fact that the favorite download folders are selectable in a menu menu in the prompt. I would like to add that DownThemAll (another extension) adds functionality similar to that of FavLoc, as shown in your second image. …this plus it adds download management! That’s what I was looking for, thanks! Random question: do you know how to instruct Firefox where to download files from a particular site? I download all my files to my desktop, however, there is one site from which I download Excel spreadsheets that I’d like to automatically download to a specific folder. 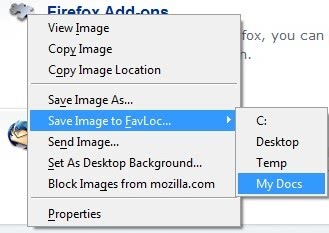 Rather than have Firefox prompt me to choose the download location manually, is there a way to set up site-specific download locations?